Over at webecoist they have a fab story covering the san francisco mobile pizza joint that is yes you guessed it made from a recycled shipping container. The oven is on the upper level, where the cook shapes and bakes all the fresh Neapolitan pies. The pizzas are then delivered to the lower level via a special rack, where the cashier doles them out to customers. While you can’t expect a Slate Kitchen Floor or the latest Kitchen Cabinet Layouts owner Jon Darsky has suppassed expectation by installing a 5,000 pound wood-fired pizza oven. 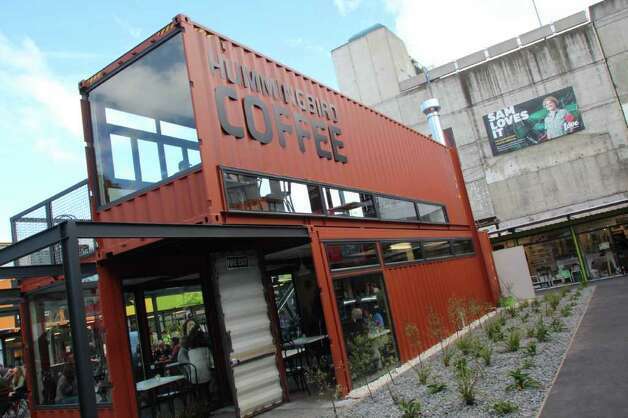 While you could argue that we’ve seen recycled shipping containers used for resteraunts before (who can forget the Shipping container Starbucks we ‘aint never seen anything like this! Be sure to check out webecoist for the fully story and lots more photo’s. And of course if your in the San Fran area be sure to check it out! A business hub constructed entirely from shipping containers has been unveiled in Sunderland. The £1.2m building – which will house 10,000ft2 of offices and accommodation for start-up businesses – was constructed using 37 used shipping containers. Each one of the containers will typically have been in use for 20 years, travelling upwards of 1 million miles around the world. Check out the link above for the full post. From the Gainesville Sun comes a story that I’ve often asked myself – do shipping container homes look a little, well – ugly. The story reports on Tom Fox who has built a shipping container home (three level an constructed from 12 containers). Yes of course there are some great example of some beautiful container homes (check out the ones on this site for example) – but you can’t get away from thinking they look a little boxy. “I don’t think that it is a part of the neighborhood,” Williams said. “The houses that are here, it is just out of place. And right now, with it not being painted and everything, it’s really an eyesore. Here’s a pic of the site – we’d love to hear what you think – (that’s what our comments section is for!!!). Here’s one that’s a little left field…. In alot of our posts we discuss the beauty that is shipping container homes – we’ve shown you some great examples too -but we came across this story – that we found courtesy of http://www.yourcontainerhome.com/ who write about a recent shipping container project involving the building or a toilet block from shipping containers. New facilities have been planted at the Bowl of Brooklands to replace a toilet block destroyed by fire last week. The unisex toilet, which was installed a week ago, is a retrofitted shipping container painted a fetching forest green. Earlier this month, firebugs torched the toilet block at the northern entrance to the TSB Bowl of Brooklands. While the destroyed toilet block had about a 10 toilets the new container houses only three. Pukekura Park curator Chris Connolly said the toilet situation for Womad would not be a problem because organisers would get more. The shipping container would be open 24 hours a day, seven days a week, and cleaned regularly, he said. http://www.chron.comn have a truly inspiring piece on how Christchurch in New Zealand are recovering their town from recent earthquakes. Back in September 2010 – an earthquake measuring 7.1 hit the NZ city this caused some minor damage but it was the follow up ‘quake back in Feb 2011 which resulted in over 180 deaths and wide spread destruction of local buildings. More than 900 buildings in the district are tagged for demolition and, possibly, to never be rebuilt; 6,000 structures in the region are red-tagged; and the relatively new AMI Stadium, the outlet for rabid rugby pride, will probably have to be demolished. 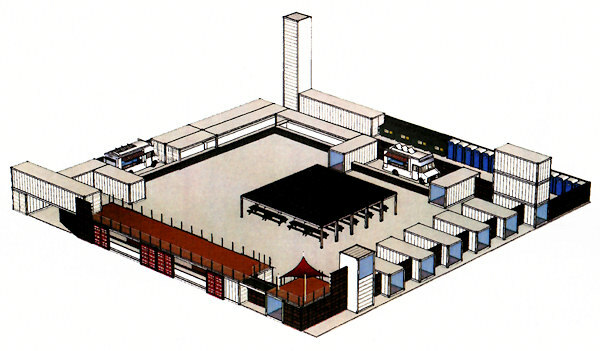 Given the task ahead its unsurprising to think that the local residents looked for opportunities to get themselves ahead of the build time associated with traditional property builds – businesses looked to rapidly recover the situation and have initially opted for a mall constructed with shipping containers allowing them to trade within weeks rather than months. Some of it will be done with bricks and cement, some with shipping containers. Either way, while sitting among the bustling, vibrant “new” City Mall, it was clear: Unlike the pills at the drugstore just blocks away, Christchurch itself doesn’t appear to have an expiration date. Head over to the site (link above) to check out the full range of photographs which include this fantastic 2 shipping container cafe. Jdland.com has a great piece on an upcoming shipping container market in DC. While container malls/markets are nothing new we love the idea of local artists decorating the containers to make them look more – well – interesting. Container homes often get criticised for their external appearance so we love this idea. After our recent posts about other types of shipping container buildings, from drive thru starbucks through to underground container bunkers you could be forgiven for thinking we’d taken our eye of the fact you can build homes with these things too! – well we’re glad to report on this little beauty courtesy of http://inthralld.com’s recent post on a guest house built from shipping containers. Utilizing only one container to build the guest house we love the simple but effective lighting and the decking area. While here at your shipping container home we tend to look at how you can build your ideal home using shipping containers we’re not averse to looking at things a little differently – and this is a real great example!! The video below shows a 20ft shipping container turned into an underground shelter – while burying your container does seem to be a little extreme – it does show how….ahem…..versatile these containers can be. We’d love to know what you think – fire us some comments below! Treehugger.com has a great feature on Patrick Partouche “Maison Container”. Built from 8 shipping containers and featuring what you might call a rough and ready looking exterior the killer is the absolutely stunning interiors. Patrick has really created something here that shows off what can be done with container living and whilst this comes at a price (and I think a hefty one!) it shows that with a bit of creativity and planning you can pull off something truly wonderful. It’s funny but the exterior (shown above) doesnt quite match the boldness of the interiors but you can sure tell what he used for his basic construction with the familiar shapes and lines that only a shipping container provides! Be sure to click the link above to look at the full photo set – you wont be disappointed.